When Ludovic Travers arrives in the South of France to say a few well-chosen words to his wife’s shady relative, Gustave Rionne, he finds them unnecessary: a knife-thrust a few minutes before had put an end to Rionne’s career. Also down on the Riviera, on business connected with the notorious murderer Bariche, is Inspector Gallois of the Sûreté. Joining forces, they are soon confronted with a second even more baffling murder. What is the connection, if any, between the two crimes? Who are the masked trapezists in the circus, and what is the significance of their performing rat? The car smash—was it deliberate? Had Madame Perthus been Letoque’s lover? 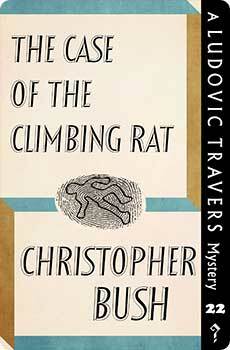 Ludovic Travers has been involved in some curious cases but none so strange and absorbing as that of the Climbing Rat. The Case of the Climbing Rat was originally published in 1940. This new edition features an introduction by crime fiction historian Curtis Evans.